The UK Youth team played a strong German team, on Saturday 15th December, and lost 4-1. This was our 2nd match in the 2018/19 European Youth Go Team Championship (EYGTC). This is our 2nd match in the 2018/19 European Youth Go Team Championship (EYGTC). The match is interesting. We narrowly won our opening match against Croatia. Germany may prove an even harder test. They have a very strong squad, but are wisely and sportingly giving mid-order players some match experience. We thus have an outside chance of winning it, but only if everyone plays up to their top level. Our team lost three games to one against a strong team from the Netherlands. This put our team down to bottom place in the Pandanet B division, behind Denmark. After four rounds, in the B League out of A-D, four teams have three wins: Serbia, Sweden, Austria and Belgium. This win left Netherlands in fifth place. The next match will be on Tuesday 22nd January, against Austria. Alex Kent wrote: I lost by resignation against Geert Groenen, but I feel I played a lot better this game (at least in the opening) so I'm not too regretful! Probably the hardest choice I faced early on was how to handle my opponent's 3-3 invasion on move 28. I ultimately played the double-hane variation, but it was a bit of a toss up between that and the keima-and-try-to-retain-sente one. The 2018 Coventry Tournament was held on 24th November in its usual Warwick University location. 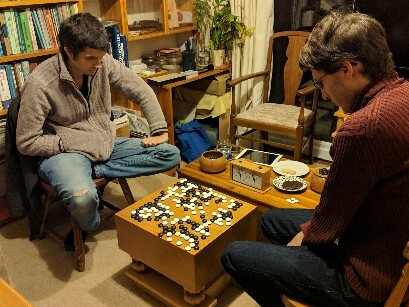 This year 38 players took part and Philip Leung (4d University of Warwick) won the event for the third time in a row and the fourth time overall. This is particularly noteworthy as Philip was also the event organiser. 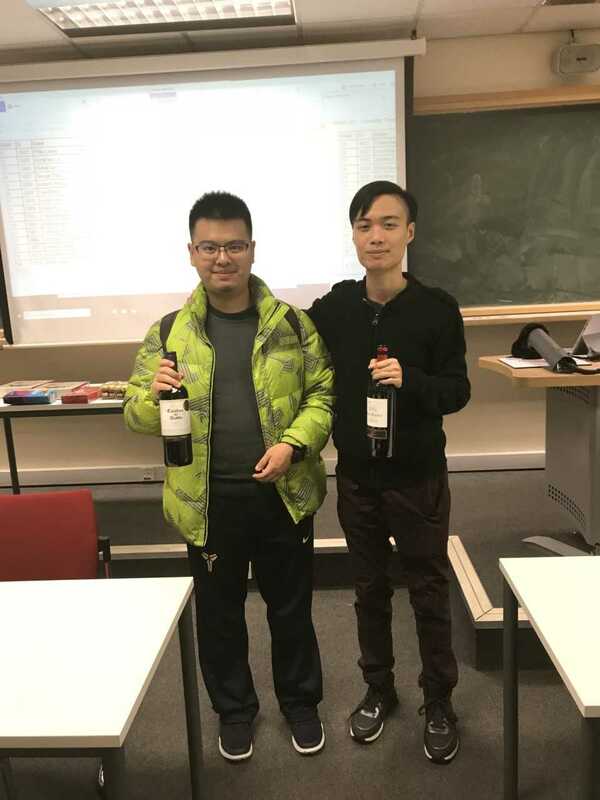 Honghao Lu (2d Manchester University) and Peikai Xue (1d Central London) were first and second runner up respectively, with two wins out of three, both only losing to the winner. The picture shows Philip (right) with Peikai. James Taylor (8k University of Warwick) and Rowan Borrow (15k Cheadle Hulme School) were the other prize winners for three wins. Alison Bexfield, UK Youth Team Captain, brings us these 2 stories - the first pre-match, and the second post-match - to follow on from her UK Squad announcement. The 2018/19 European Youth Go Team Championship (EYGTC) is held online over four rounds, on KGS. The UK Youth team is today (24th November 2018) playing its first international match of the season, with a game against Croatia. The UK is starting in the second half of the 12 national teams, so is playing another of the teams in our half of the draw. My UK team selection takes account of a number of things, including selecting a team that could win the match, trying to make sure all team players have a chance to play at least one match in the tournament, and trying to make the games not too unbalanced. Last updated Mon Nov 26 2018. If you have any comments, please email the webmaster on web-master AT britgo DOT org. I am pleased to announce this year's UK Youth Team for the European Youth Go Team Championship 2018/19 (EYGTC). This is held online over four rounds on KGS. Traditionally we have done quite well in the U12 age groups, but less so at the top end, where often board 1 is a mid-rank dan player. Alex Kent wrote about his board one game against Lucas Neirynck: I lost by resignation. As black I opened with a Kobayashi style fuseki, and instead of playing the "normal" two-space approach my opponent played the 3-3 invasion in the upper-right. 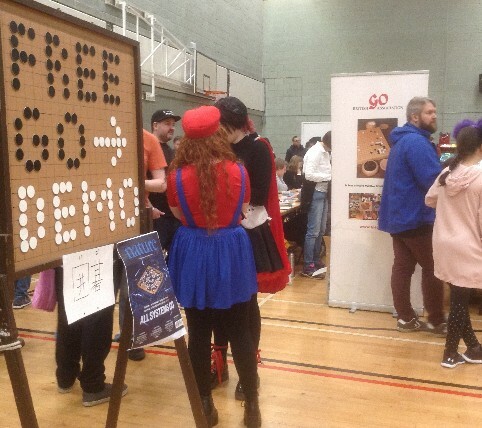 17 BGA members kept 7+ demo-boards busy, from 10am to 6pm, after setting-up of our stalls from 8am. This number helped cover us at busy times, and enabled us to take refreshment & other breaks.